GENA-Autosport -- für professionellen Motorsport! Welcome to Gena Autosport ! Well prepared, we started with our Ford Fiesta 1.6 16V into the new season 2016 of the FIA European Touring Car Cup (ETCC), Super 1600 category. Kevin is FIA ETCC Champion 2013! In the S1600 class Kevin showed in the qualifying all his strength and won the pole position. This he continued in race 1 and saw as first the chequed flag, despite a bump from the back of his competitor 'Romeo Luciano' in the second lap - and this was the early decision, Kevin´s 81 points are not to beat. Due to a broken drive shaft Kevin sadly couldn´t finish race 2. However, he could almost reach his goal to win all races in this season: four pole positions and seven victories out of eight races, Kevin secured his 2nd consecutive victory in the FIA ETCC S1600 cup. A very happy Kevin Krammes said many thanks to his wonderful team, for building the great car and giving the nice and professional support! Congradulations from your Ravenol Team GENA, Kevin! Again, Kevin Krammes has won maximum points on a exciting and diversified racing weekend at Salzburgring! After finishing the thirty-minute free training on the third position in the S1600 class, Kevin pulled off the thrilling qualifying as winner with a 6/100 of a second ahead of Gilles Bruckner. This promises to be a strong race. Beginning of race 1 light rain fell, that the decision for tires was open up to the last second before the start of race 1. After a dramatic scene with S2000 cars, the race was declared to wet race during a safety car period. During a stoppage period then the teams could switch to rain tires before restart. And it was Kevin again who was quickest with his speedy Ford Fiesta 1.6 16V and won also race 2. He still leads the table clearly with 68 points ahead of Gilles Bruckner (37 points) and 'Romeo Luciano' (32 points). Watch the race video at www.fiaetcc.com! Quite different are the start conditions at the second event at the challenging Slovakiaring, with 5,9 km the longest track of the this year´s contest. With sun and summer temperatures, Kevin sets the bar high in the first practice and gives the fastet time, to consistently secure the pole position for the race in the qualifying. Right after the start of race one, 6 cars collided in turn 1 in front of Kevin´s Fiesta. He kept the overview, and, paired with a pinch of luck, he drove out of this confusing situation and won race one. After a successful start of the second race, the two pilots Ulrike Krafft and 'Romeo Luciano' were close on Kevin´s heels, as happened already in the free practice, in the qualifying and in race one. Nevertheless he was able to increase the distance a little bit and saw the chequed flag as first after a really exciting race, very happy and satisfied. Thus he extended his point lead clearly to 45 points ahead of Ulrike Krafft and 'Romeo Luciano'. Thanks for the great work and support to the whole team! The first event on the 5,8 km long Monza racetrack promised a fast race. Our driver Kevin Krammes assured the 2nd position of the Super 1600 category already in the qualifying, right behind Giles Bruckner. In continuous rain, Kevin kept his nervs and was really happy about his first race win this year. Despite adverse conditions, he won also the second race convincingly and now leads the score chart with 22 points, ahead of Giles Bruckner and Ulrike Krafft. 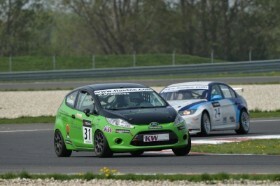 We are looking for ambitioned racing drivers for FIA ETCC 2013 with Ford Fiesta Super 1600 to strengthen our team!